A blog about health and wellness. Helping Families Work From Home! The garbage-man WILL NOT take these types of items as they are considered HAZARDOUS WASTE. Check your local city by-law web page, you'll see! There is only one question. Why are they in YOUR house and around your family? What could they be doing to your family's health! I'm quite passionate when it comes to educating families about the dangerous toxins and chemicals that we're exposed to in our homes everyday and what they can do to the health of Your Family! Quite a few years ago, my son was suffering with allergies and eczema. 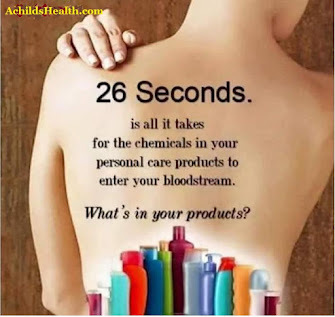 I started researching what was in my products at home and made a decision not to expose my family to anymore of them! 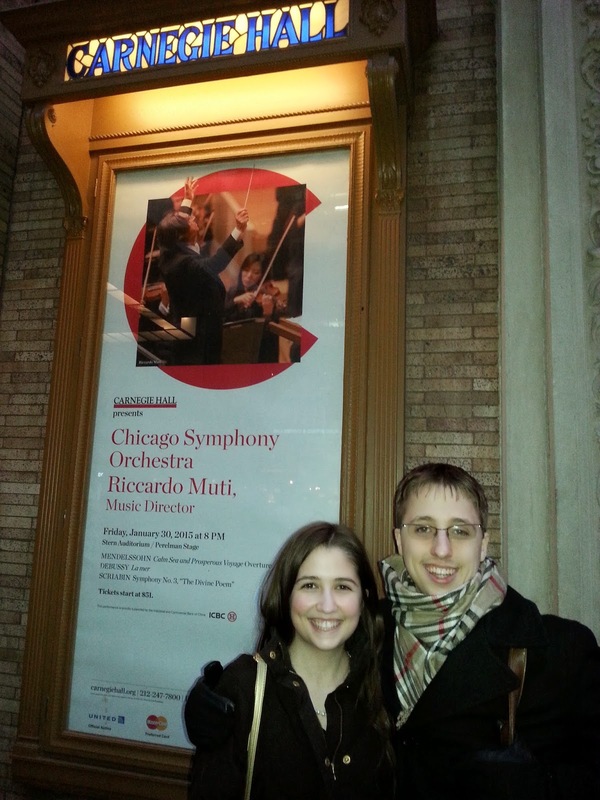 Meet my kids...They're my reason! Shortly after removing the toxic products from our home, I noticed my son wasn't needing his inhaler hardly at all and we didn't need the steroid creams for eczema! I decided that if I could help even one family get relief from the same issues, I was going to make it my mission to do just that....and I have! The show below originally aired over 10 years ago....what has changed? Nothing! 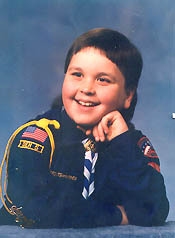 However, there's a safe alternative I found over 15 years ago. I don't sell products but I sure love educating and helping others to make safer choices for their home and family! Be sure to Watch! Healthy living should be easy and affordable for Everyone! * Antimicrobial Soap Ingredient Linked To Liver Disease...so what's the alternative?? How many people have this in their homes? It's encapsulated so very difficult to get out of carpets and even drywall! As a stay at home mom, I was alarmed to learn that a 15 year study found that women who worked at home had a 54% higher death rate from cancer than women who had jobs outside the home. According to the EPA, Indoor Air Pollution is one of the most important environmental health problems. The Consumer Product Safety Commission says, Of chemicals commonly found in homes, 150 have been linked to allergies, birth defects, cancer, and psychological abnormalities. There are basically 3 ways that toxic chemicals can enter our body: by swallowing, by breathing, or by contact with skin or eyes. 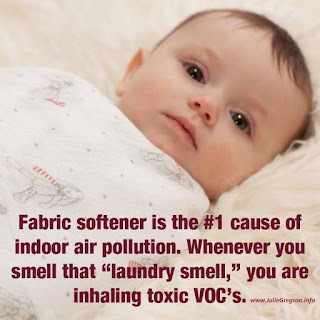 I think it's important to say that household cleaning and personal care products are not the only source of chemicals in our homes, but, as you will see, they are some of the most toxic and deadly. Fortunately for us, they are also the easiest to replace! This site is not only meant to inform, but is also a call to action! Knowing that the chemicals in your home can seriously harm your children, wouldn't it be better to get them out of your home? There are alternatives and you have a right to know what they are! Ask me! Our Mission is to inform families of the dangers of commonhousehold products. 89% of all poison exposures occur in the home? Every 14 seconds poison control is called? Household cleaners are the #1 cause of poisonings in children? Regular shampoos often contain formaldehyde as a preservative? 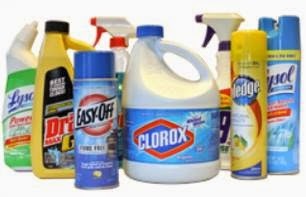 Common household products have been identified as triggers of asthma? Manufacturers ARE NOT required to list the exact ingredients on a label? Chemical names are often disguised by using "trade names", so you may not recognize the chemical for what it truly is? Why Should We Worry About Toxic Chemicals? According to the EPA, most homes have airborne concentrations of hazardous chemicals that are two to five times higher indoors than outdoors. According to the EPA, toxic chemicals found in the home are three times more likely to cause cancer than outdoor airborne pollutants. The Consumer product Safety Commission connects 150 chemicals commonly found in our homes to allergies, birth defects, cancer and psychological disorders. The National Cancer Institute has a list of twenty known carcinogens and over 2,200 chemicals that are probable carcinogens. Many of these chemicals are in the cleaners and personal care products you buy at your local grocery store. DANGER - Harmful or fatal if swallowed A taste to a teaspoonful taken by mouth could kill an average sized adult. WARNING - Harmful if swallowed A teaspoonful to an ounce taken by mouth could kill an average sized adult. CAUTION - Harmful if swallowed An ounce to over a pint taken by mouth could kill an average sized adult. AIR FRESHENERS: Most air fresheners interfere with your ability to smell by coating your nasal passages with an oil film, or by releasing a nerve deadening agent. 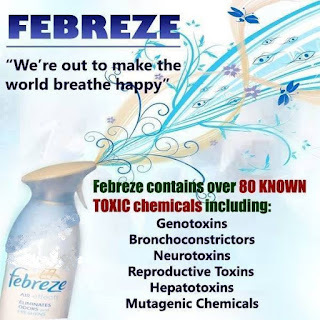 Known toxic chemicals found in an air freshener: Formaldehyde: Highly toxic, known carcinogen. Phenol: When phenol touches your skin it can cause it to swell, burn, peel, and break out in hives. Can cause cold sweats,convulsions, circulatory collapse, coma and even death. AMMONIA: It is a very volatile chemical, it is very damaging to your eyes, respiratory tract and skin. BLEACH: It is a strong corrosive. It will irritate or burn the skin, eyes and respiratory tract. It may cause pulmonary edema or vomiting and coma if ingested. WARNING: never mix bleach with ammonia it may cause fumes which can be DEADLY. CARPET AND UPHOLSTERY SHAMPOO: Most formulas are designed to over power the stain itself, they accomplish the task but not without using highly toxic substances. Some include: Perchlorethylene: Known carcinogen damages liver, kidney and nervous system damage. Ammonium Hydroxide: Corrosive, extremely irritable to eyes, skin and respiratory passages. DISHWASHER DETERGENTS: Most products contain chlorine in a dry form that is highly concentrated.# 1 cause of child poisonings, according to poison control centers. DRAIN CLEANER: Most drain cleaners contain lye, hydrochloric acid or trichloroethane. Lye: Caustic, burns skin and eyes, if ingested will damage esophagus and stomach. Hydrochloric acid: Corrosive, eye and skin irritant, damages kidneys, liver and digestive tract. Trichloroethane: Eye and skin irritant, nervous system depressant; damages liver and kidneys. FURNITURE POLISH: Petroleum Distillates: Highly flammable, can cause skin and lung cancer. Phenol: (see Air fresheners, Phenol.) Nitrobenzene: Easily absorbed through the skin, extremely toxic. MOLD AND MILDEW CLEANERS: Chemicals contained are: Sodium hypochlorite: Corrosive, irritates or burns skin and eyes, causes fluid in the lungs which can lead to coma or death. Formaldehyde: Highly toxic, known carcinogen. Irritant to eyes, nose, throat, and skin. May cause nausea, headaches, nosebleeds, dizziness, memory loss and shortness of breath. OVEN CLEANER: Sodium Hydroxide (Lye): Caustic, strong irritant, burns to both skin and eyes. Inhibits reflexes, will cause severe tissue damage if swallowed. ANTIBACTERIAL CLEANERS: may contain: Triclosan: Absorption through the skin can be tied to liver damage. LAUNDRY ROOM PRODUCTS: Sodium or calcium hypocrite: Highly corrosive, irritates or burns skin, eyes or respiratory tract. Linear alkylate sulfonate: Absorbed through the skin. Known liver damaging agent. Sodium Tripolyphosphate: Irritates skin and mucous membranes, causes vomiting. Easily absorbed through the skin from clothes. TOILET BOWL CLEANERS: Hydrochloric acid: Highly corrosive, irritant to both skin and eyes. Damages kidneys and liver. Hypochlorite Bleach: Corrosive, irritates or burns eyes, skin and respiratory tract. May cause pulmonary edema, vomiting or coma if ingested. Contact with other chemicals may cause chlorine fumes which may be fatal. Where do I buy cleaning products that are safe for my kids and the environment and don't cost an arm and a leg? From a company that cares about all that I’ve written above and a whole lot more! I’m not an expert, I’m not a scientist or a Doctor, but I’ve done my research and wanted to share what I’ve learned. I feel that this issue is too important and I just can't sit back and do nothing. your family and our environment. Thank you so much for stopping by to take a look! In the article, Environmental Health Threats to Children: A Look at the Facts, Dr. Philip J. Landrigan, widely recognized as one of the nation's foremost experts on children's diseases and environmental exposures, notes that children's exposures to newly developed chemical toxins in today's society have replaced classic infectious diseases with chronic, complex, handicapping conditions that affect multiple organs. He says that in children, these diseases are largely unknown and have not been adequately studied, but environmental factors are strongly suspected to play an etiologic role. In an interview with E Magazine, Dr. Philip J. Landrigan expresses concern that a "whole range of chemicals have the potential to get into the developing brain and cause damage. 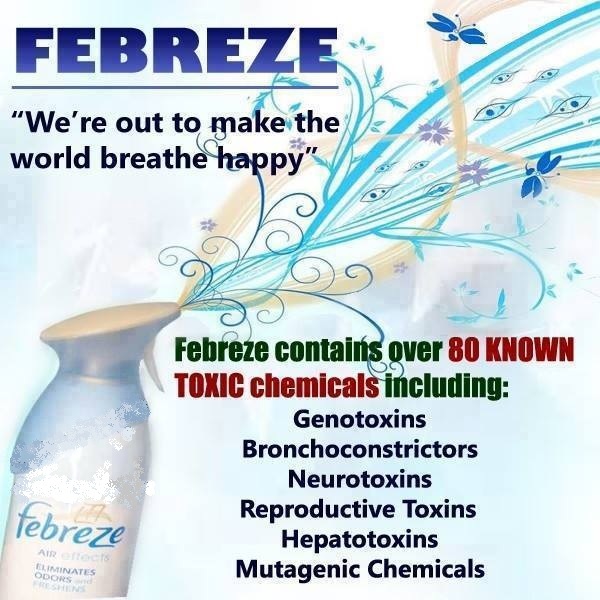 Chemicals can be toxic to the brain at a pretty low level." It's that time of year again, but now there's a new "Super Strain" to worry about! My family had to deal with this BIG "Little" problem but thank goodness for these natural alternatives! Click Here to Read more informative and life changing articles!